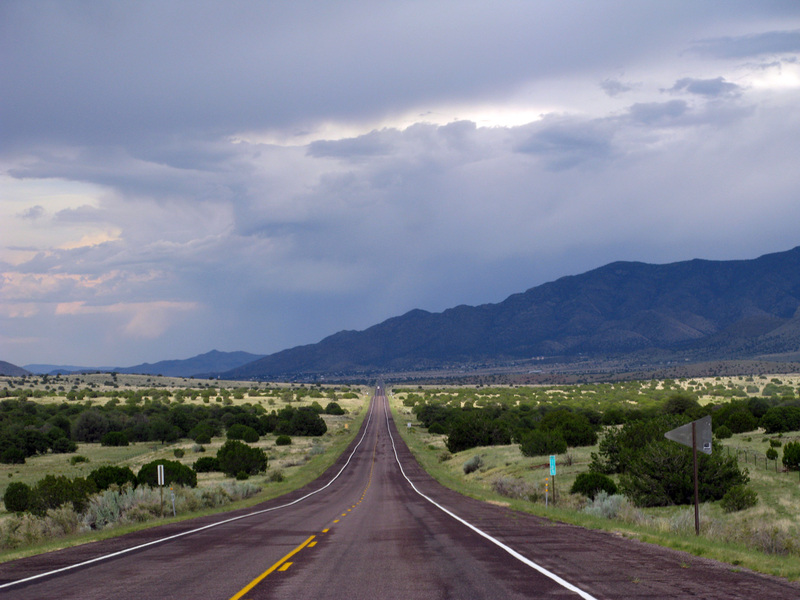 On the road in southern New Mexico. We left Alpine TX and the comfy Lost Alaskan RV park for the second time and headed west towards Marfa yet again. While filling up at a gas station in Alpine, two US Border Patrol trucks pulled in to fill up next to us. Their suped up Ford F-350 off- road machines looked so cool next to the Jeep, I asked one of the guys if it was OK for me to take a picture. No, it was not, good thing I asked! One of the friendlier agents chatted me up after he noticed our Maryland tags. Agent Dave told us that the “best pizza place west of the Mississippi” was in Marfa and that we had to check it out. Since it was an official recommendation by the US Border Patrol, we headed straight for the Pizza Foundation, even though we had just eaten lunch. Dave was right on, the pizza was incredibly good! 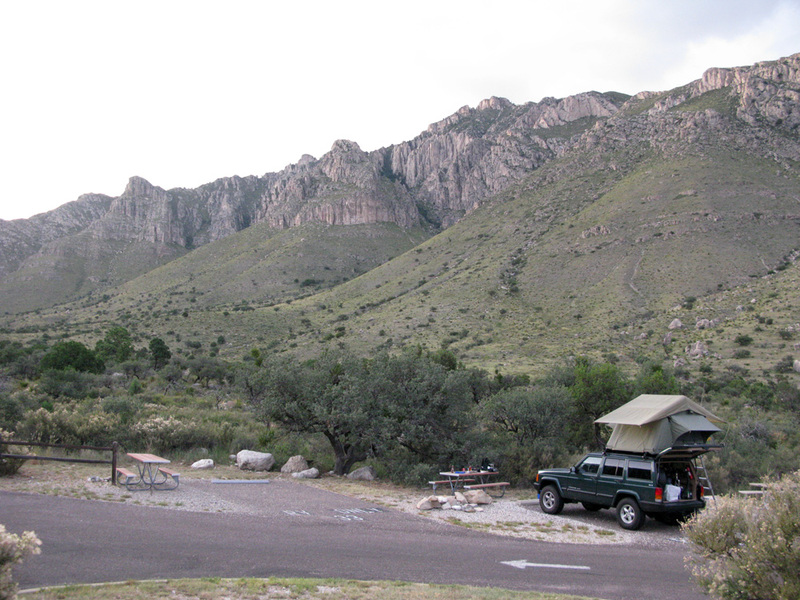 Stuffed full of food and fuel, we pressed on from Marfa due North towards our last stop in the lone star state, Guadalupe Mountains National Park. We pulled into the campground around 4pm but it was windy and rainy so we just chilled in the Jeep for a while until things cleared up. This was the first time rain has delayed our plans, not bad! Once the storms passed we set up the tent, had a snack, and hit a nearby trail called Devil’s Hall. It was a four and half mile out and back that lead up a washed out creek bed (called an Arroyo) and into a tight passage way between two cliffs, very cool. 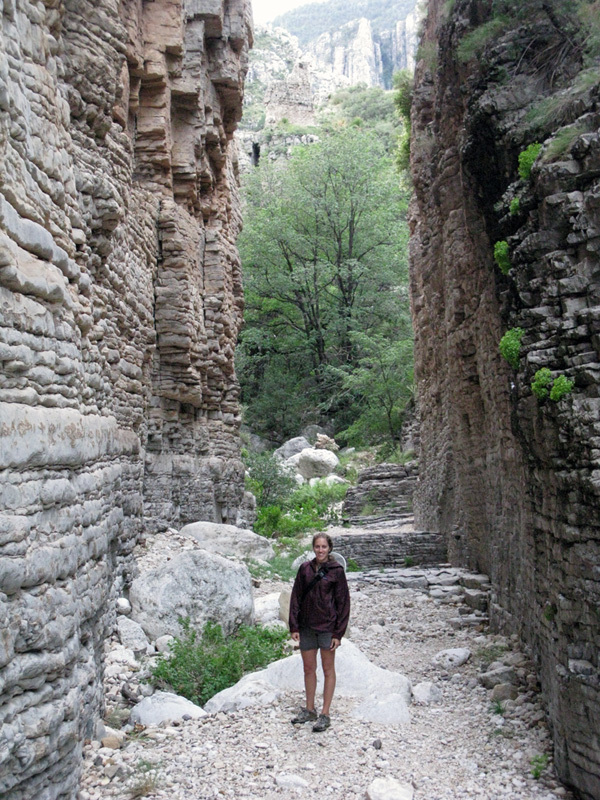 Hiking up the Devil's Hall trail in Guadalupe Mtns National Park. We had the beautiful campground all to ourselves. 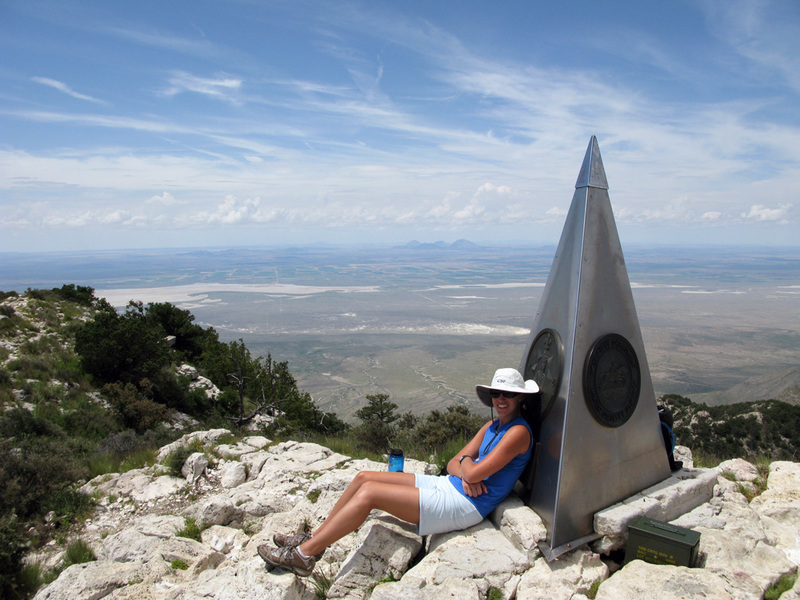 We talked about getting up really early the next morning to climb up Guadalupe Peak, the highest mountain in Texas, but we slept in yet again… So starting up the 8.5 mile, 3000 vertical foot climb at 10am was very hot, but it turned out to be just fine. We had the whole mountain to ourselves, not a surprise since it was a Tuesday morning. The trail switched back up and up forever, then crossed a ridge and completely changed terrain. On one side it was hot and dry low scrub and around the other side of the ridge was a lush pine forest. We spent an hour on the summit enjoying the 360 degree view, and had some lunch. Heading down was quick and easy – we took a few photos along the way. We're getting better at the self timer photos, but this one still has a little grass in the way. 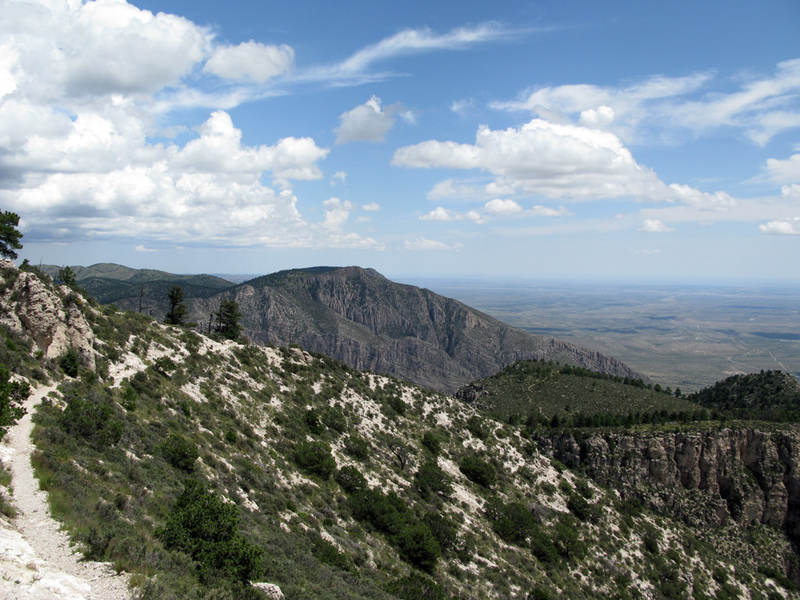 The trail up Guadalupe peak was full of switchbacks, gaining 3000 vertical feet in just over four miles. 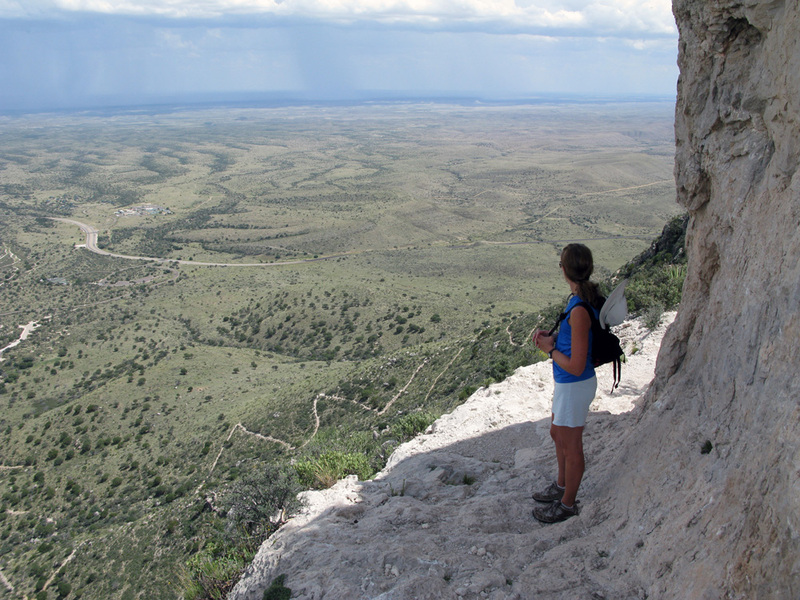 Great views from the highest mountain in Texas. That afternoon we packed up and said goodbye to Texas. New Mexico was next and we got right into it. 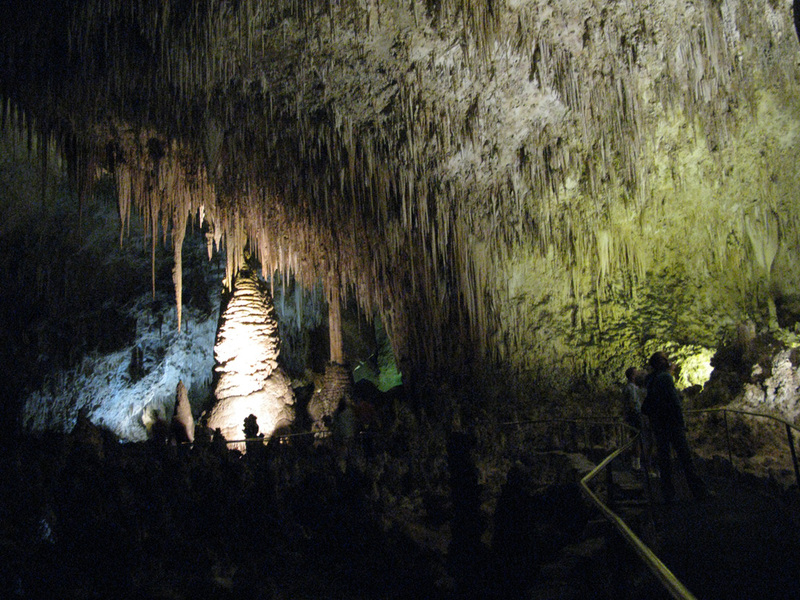 Literally, we walked down 750ft into the depths of the Carlsbad Caverns National Park. The park was beautiful, both above ground and below. The evening before we toured the caverns we went to see the famous bat flight at the mouth of the cave. It was fantastic; about 400,000 Mexican free tailed bats all depart en masse at sunset. The night we were there was particularly magical because there were dual rainbows off in the distance – it made for a stunning sight. Sorry, no cameras allowed at the bat flight. Apparently electronic noise messes up the bat’s echo location. The next morning we walked down into the caves and were so happy just to be in the cool air. The caverns stay around 56 degrees all year round, although there is a distinct guano smell at first that one must get over. Once you descend the mile long trail down into the “big room” there’s a mile and a half loop past massive stalactites and ‘mites that’s really impressive. Luckily there’s an elevator waiting to take you back to the surface when you’re all caved out. 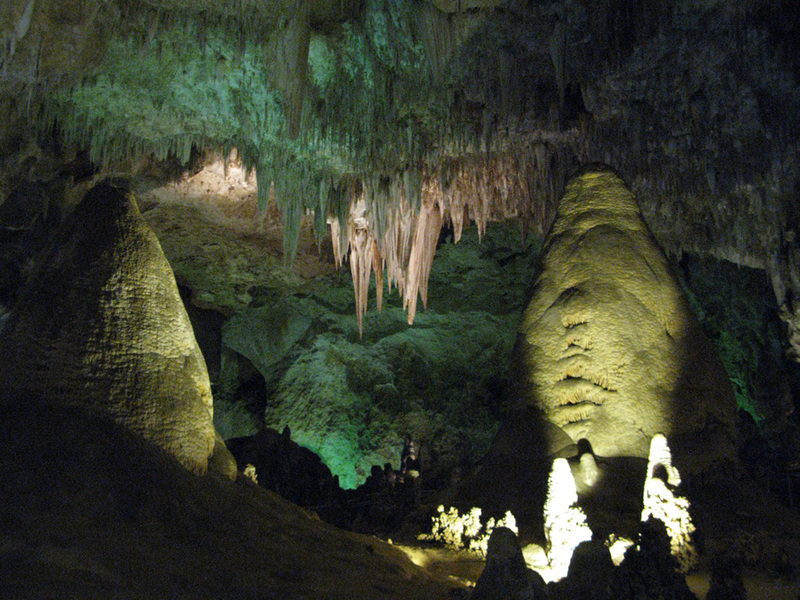 Inside the 'Big Room' at Carlsbad Caverns National Park. We left the caverns and drove on towards the town of Carlsbad where we checked out the Living Desert state park and zoo. It was very cool to see all of the animals that we hear of and see warning signs for, but never actually get to see in the wild. The zoo houses all injured animals that have been rescued and probably wouldn’t make it on their own. After Carlsbad we drove high up into the mountains to a small resort town aptly named Cloudcroft. We talked to a nice guy at the local outdoor store who gave us a great map of the area and pointed out some free campsites in the surrounding Lincoln National Forest. We were quite pleased to find a perfect spot not far from town but really secluded. That night we were up at about 9000ft, so the temperature dropped to 42! It was quite a shock, but we bundled up and slept well. 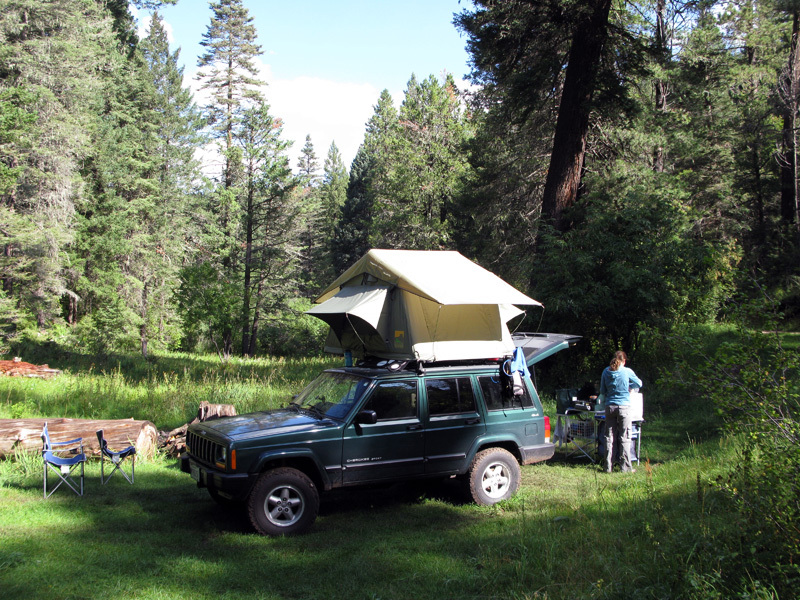 An awesome (free) campsite in the Lincoln National Forest. Caro cooking up some dinner in the camp kitchen. 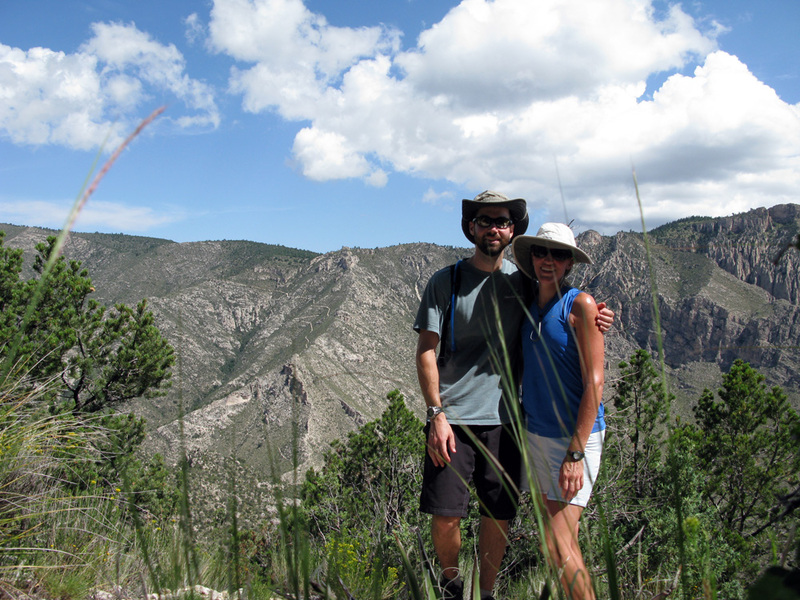 The next day we descended from Cloudcroft after a short morning hike on the scenic Osha trail. Alamogordo was our next stop and is a medium sized town that’s right on the edge of the White Sands Missile Range, National Monument, and Holloman Airforce base. Holloman AFB is famous for secretly housing the F-117 stealth fighter for years before the public even knew it existed. Who knows what they’ve got there now. I was really hoping to see some cool planes zipping around but only saw a few F-16’s and two A-10’s – nothing fancy. I should mention that on our way to Alamogordo we swung through Roswell. Of course Roswell is well known for the alleged alien landing in 1947. 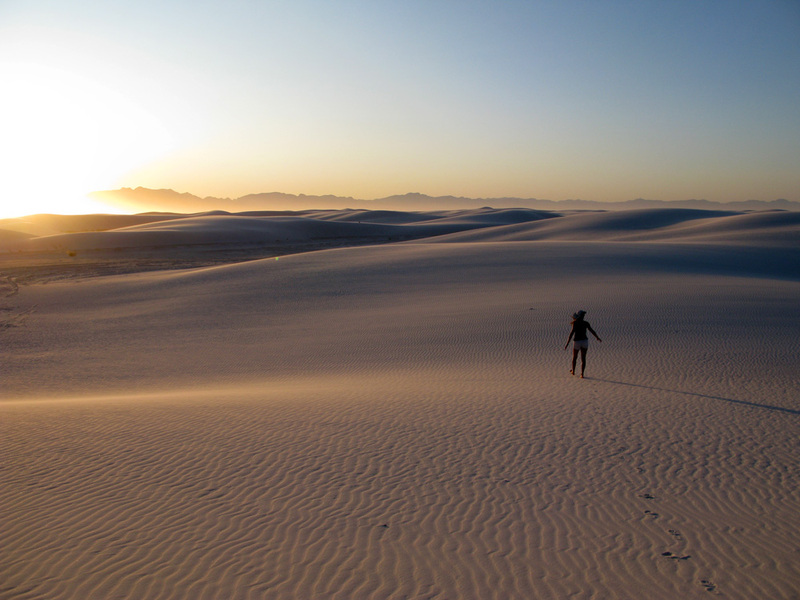 We checked out the International UFO museum – that’s 45 minutes and 10 bucks we wish we could get back… We got to Alamo early enough to relax for a while then headed into the White Sands National Monument to catch the stunning sunset over the pure white dunes. Little did we know this small park would be one of the highlights of the trip so far. Sunset there is amazing – here’s a few of the better shots for you to enjoy. The last two are sized at 1280×960, perfect for your Windows desktop background. 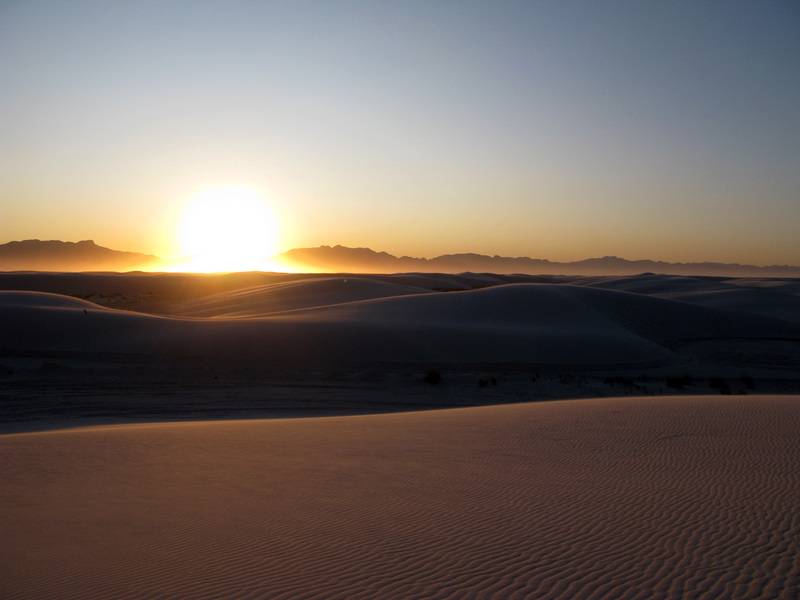 Sunset over White Sands National Monument. The next morning we finally did get up before sunrise, and drove straight back to the dunes at White Sands for an awesome early morning hike. There’s a 4.6 mile loop called the Alkali flat trail that takes you through the North West edge of the park. There were great views and a little bit of route finding to do, since the dunes are constantly shifting and burying the trail markers. We had a great walk and then made some breakfast when we got back to the car. The Alkali flat hike around White Sands. 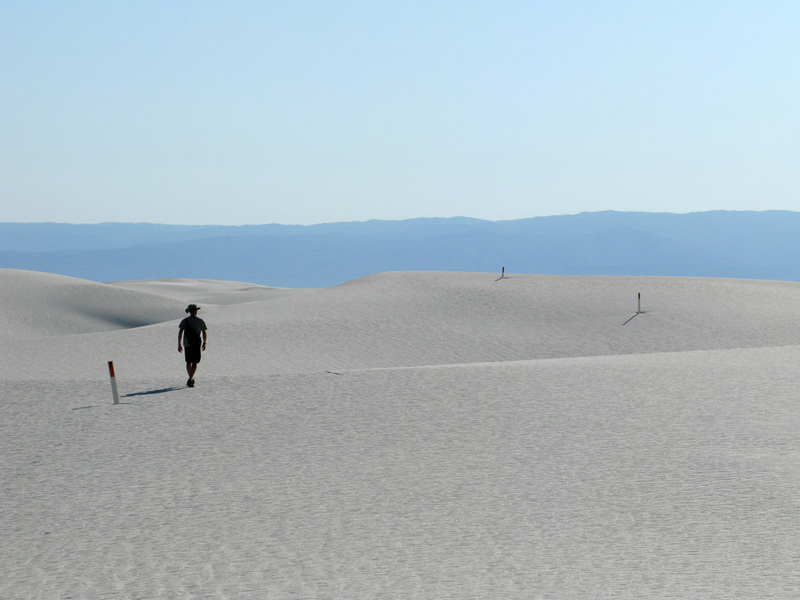 The hike went out over the dunes towards the White Sands Auxillary Space Shuttle landing site and the White Sands Missile Range. 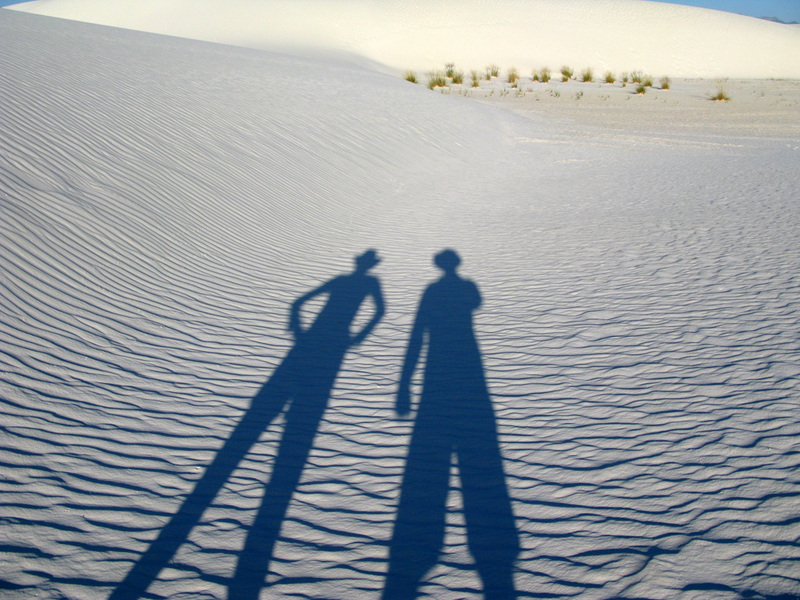 From White Sands we drove towards a funky town called Truth or Consequences. Both of us were really looking forward to another hot springs resort that was gushed about in the guidebook and offered camping. Well, we should have called, because once we showed up there was no camping allowed and the hot springs weren’t all that good either. Sort of bummed we drove around looking for a good place to spend the night. 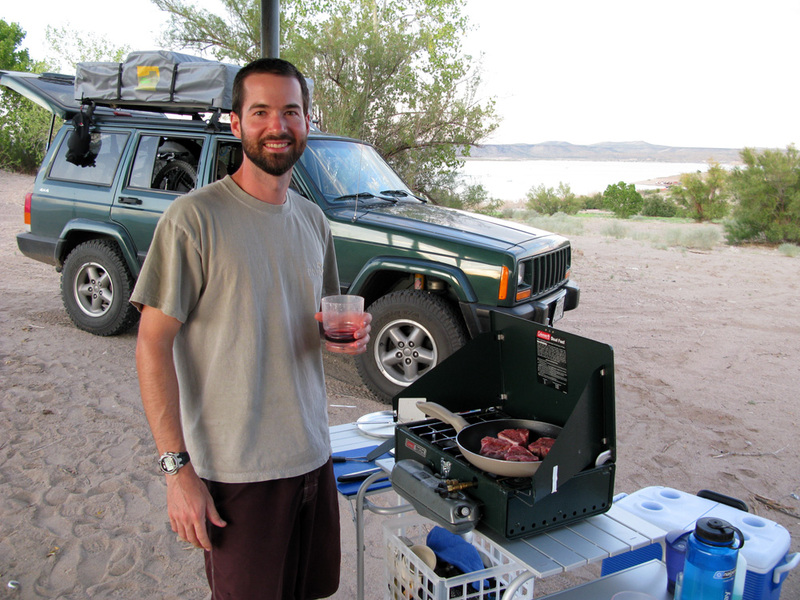 We got really lucky and stumbled upon a cool campsite at Elephant Butte Lake & State Park. 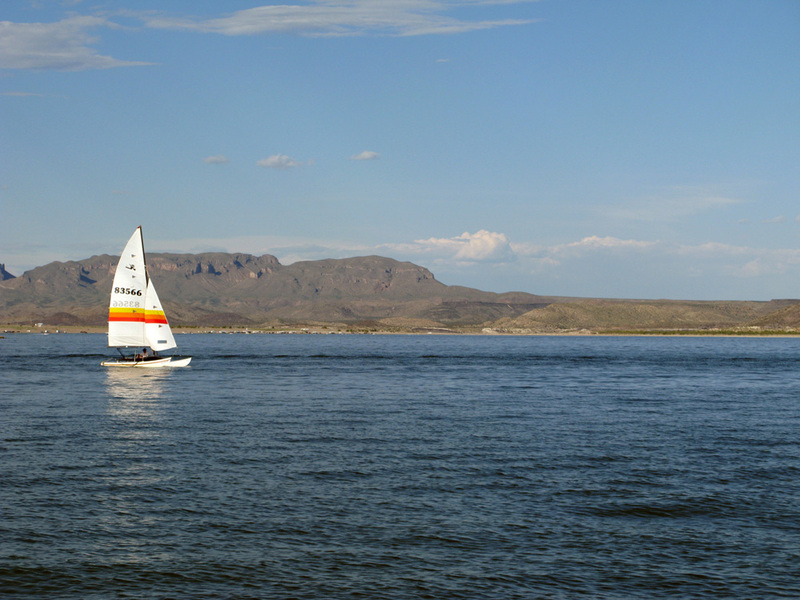 Elephant Butte is an enormous manmade lake created by a dam on the Rio Grande River. The park is basically a free-for-all of power sports; there were trucks driving all over the beaches and dunes and every form of water sport imaginable on the lake. We found a quiet spot to setup on a bluff overlooking the water and settled in for a great night. We had stumbled upon an organic food store earlier in the day while going through Las Cruces, New Mexico’s second biggest city. So that night at Elephant Butte I grilled four lamb loin chops with this simple garlic, paprika, and salt rub in a little extra virgin olive oil. It was divine! To go with the lamb, Caroline whipped up a salad of mixed greens and herbs, goat cheese, tomatoes and dried cranberries with a balsamic vinaigrette dressing. We washed it all down with an Argentine Malbec. 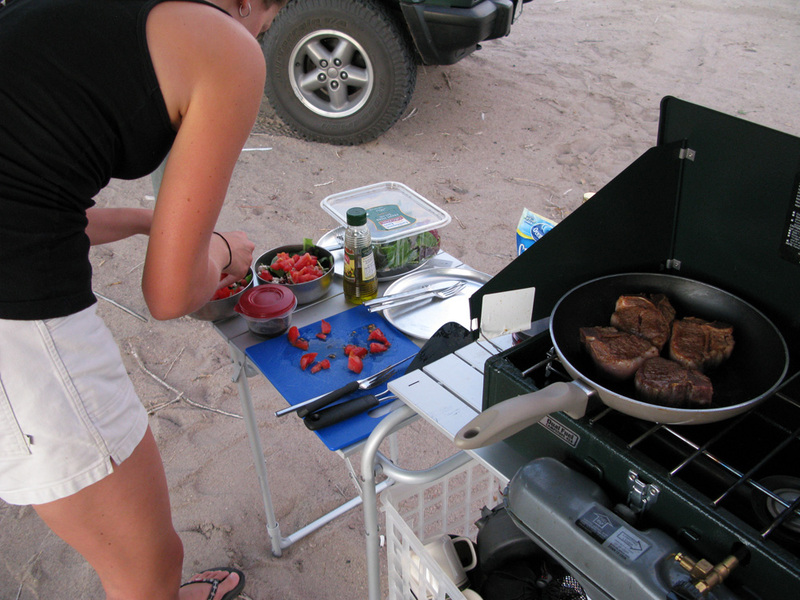 It was the best dinner we’ve ever cooked, home or camping! Elephant Butte Lake & State Park. Chef Pat cooked up some delicious Lamb chops. Caro whips up a tasty salad with mixed greens, goat cheese, cranberries, and tomatoes. It was our best cooking yet! From the ‘Butte we packed up and went for a drive along the beach through the sand before heading towards Socorro NM and the very cool Very Large Array Radio Observatory. If you’ve seen the movie Contact (one of Caro’s favorite movies), you know what we’re talking about. 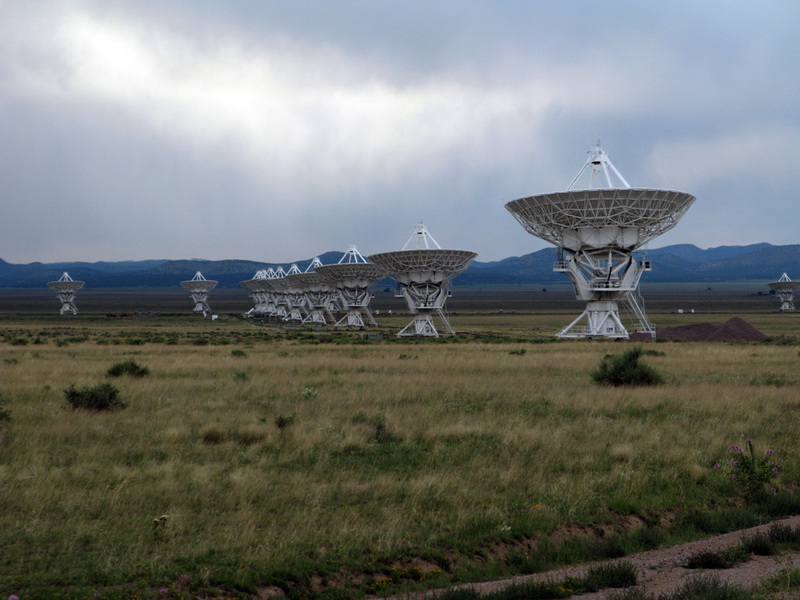 The VLA is a Y shaped array of 21 huge dishes that can be moved on train tracks up to 13 miles from the center. 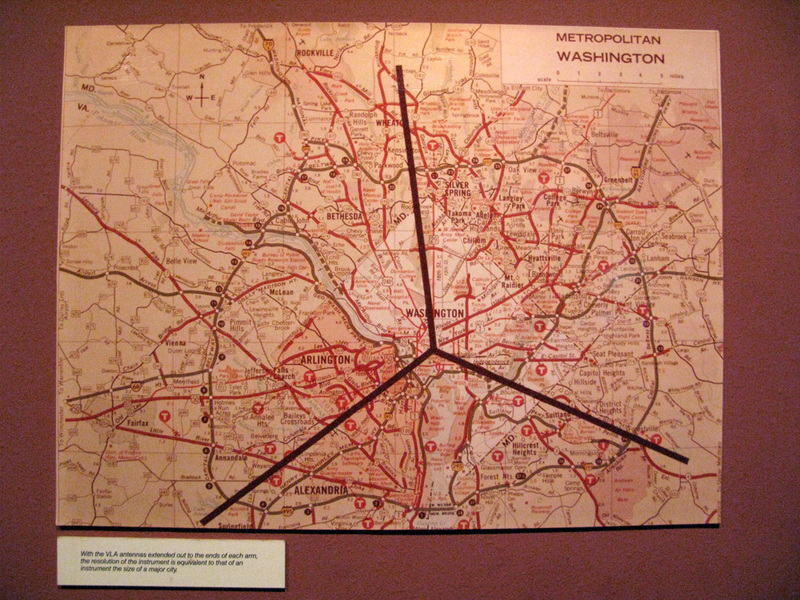 That’s 13 miles in three directions – check out the overlay of the VLA on the Washington DC map to get a sense of the scale. Its mission is to search outer space for distant radio waves. It’s out in the middle of nowhere on a 7000ft high plateau that’s surrounded (shielded) by mountains all around so there’s no interference. We took a beautiful scenic byway to get there that was dirt and rough for about 40 miles. It turned out to be a stunning drive through some beautiful country. And it was the first time I can ever remember being in four wheel drive and having the cruise control on at the same time. On the road to the VLA. 36 miles off road, nice! This gives you an idea of the scale of the VLA. Looking up for radio signals from deep space and little green men. Someone thought it would be a good idea to introduce the African Oryx (antelope) to New Mexico. No predators = population explosion. But they do look cool! 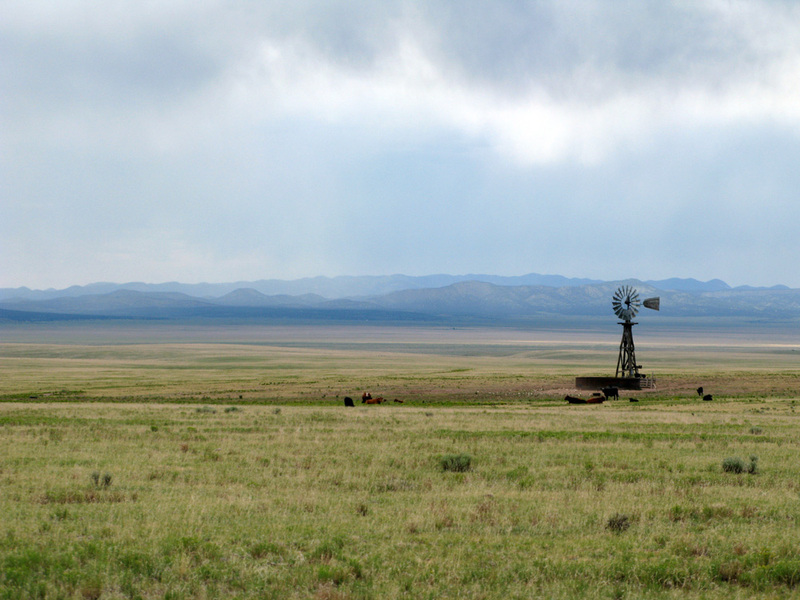 One last photo of the scenic drive to the VLA. From the VLA we cruised on up Interstate 25 stopping for the night at a nice little campground that was sadly right next to the highway and some train tracks. Good thing we keep ear plugs in the tent! Yay! I was just getting antsy for a new post. This post was probably your best yet, in my opinion. 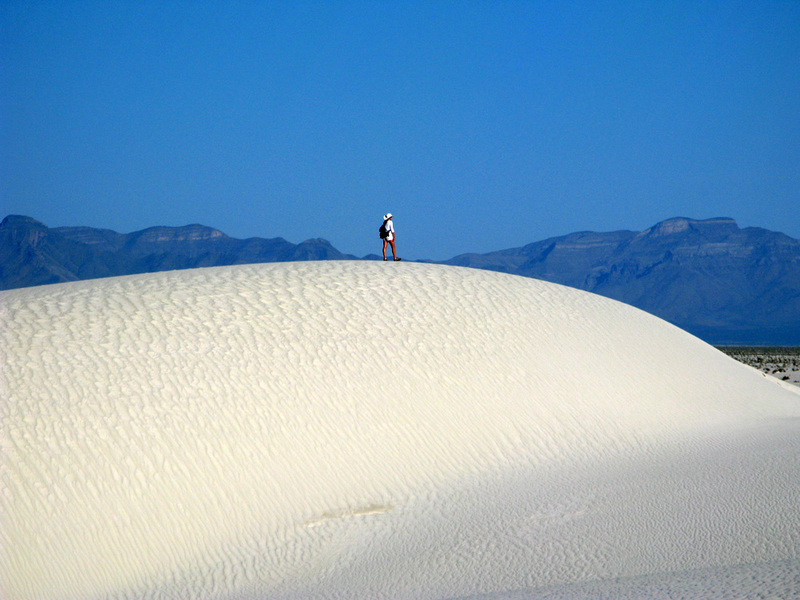 LOVE the pics of the White Sands…kudos to you for going back to see the sunrise the next morning. 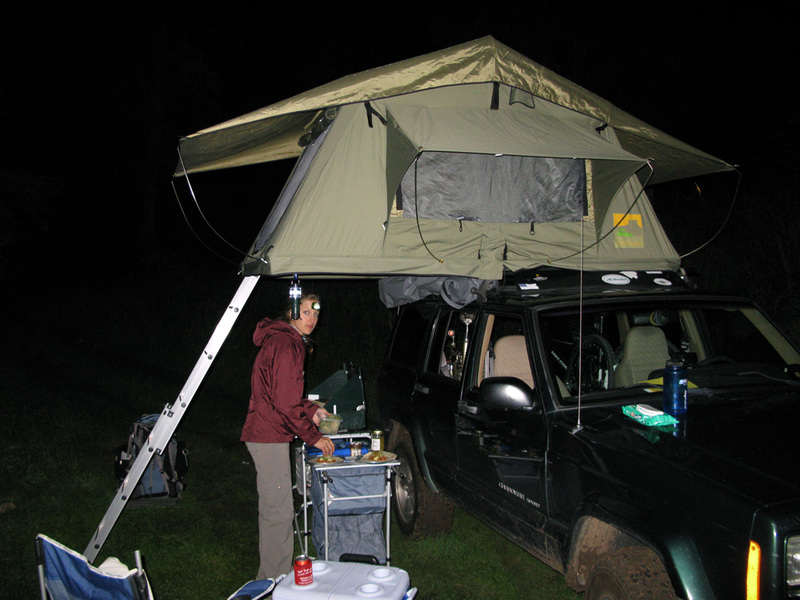 As always, I like the details about your roof-top tent living…the lamb dinner/goat cheese salad sounds divine! Carlsbad Canyon is so awesome…Jim and Wanda took us there when Dave was a pup and I was a bratty teenager, so I was too cool for most of the trip. But I remember Carlsbad being excellent. So neat that you saw the massive bat exodus. p.s. 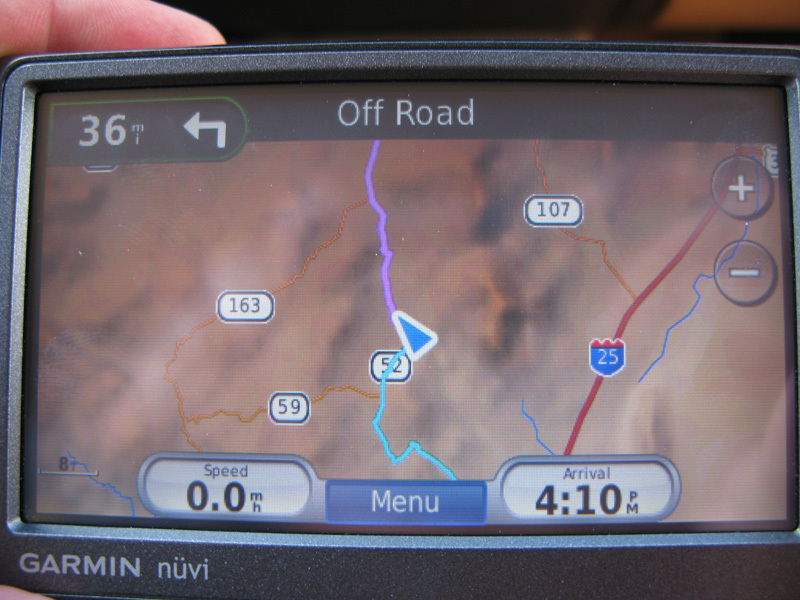 How do you remember all of the details from your hikes/travels? Do you carry a notebook with you? Consider my computer background changed! I’m already excited about a lamb chop dinner when you come home! Amazing pictures and such well written descriptions of your travels. I am truly jealous! Harry, Baby Begg and myself are thinking about both of you and hoping for safe travels! Wow I didn’t know they were on 13 mile rails like that… that is so cool!!! And nice work with the fancy outdoor gourmet yum yum yum it makes me think of our famous capers and artichoke hearts pasta. There is just way too much amazing stuff in these last 2 posts. It is really great to see everything turning out so wonderfully for you guys! WOW. Awesome photos man!! Looks like you guys are having a blast. 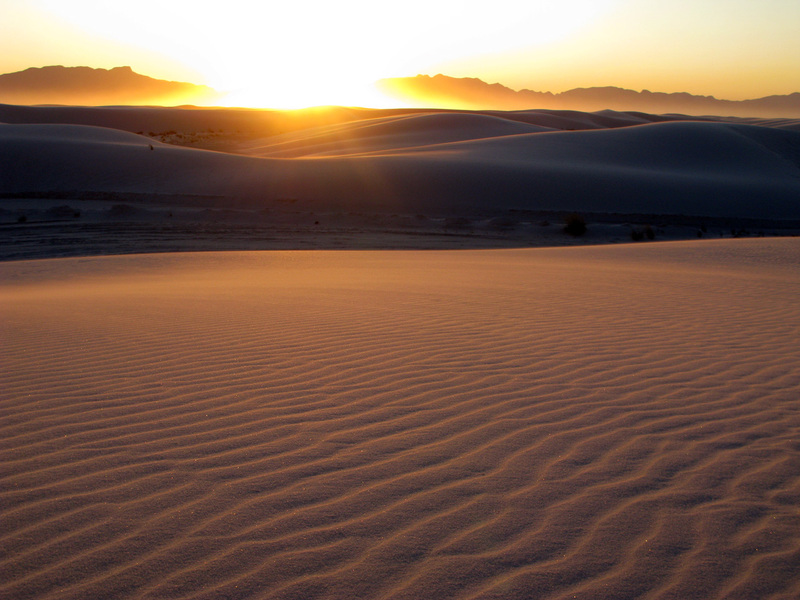 Wow, incredible shots of the White Sands at sunset! I love the grains of sand sparkling in the foreground with that golden light–great composition! You’re finding such gorgeous spots in little known places–what a beautiful country. 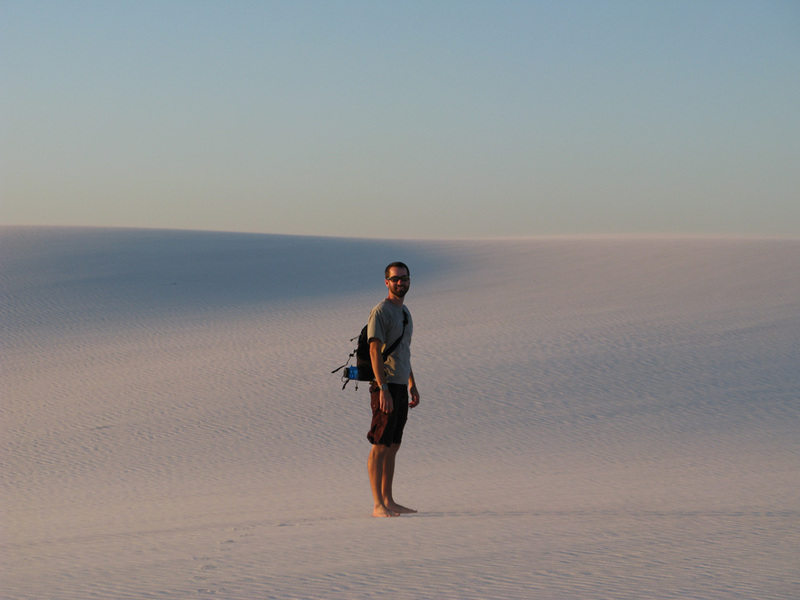 From Carlsbad caverns to Guadalupe peak, Carl Sagan’s turf and White Sands! Quite the pics! Keeps them coming! Enjoy! 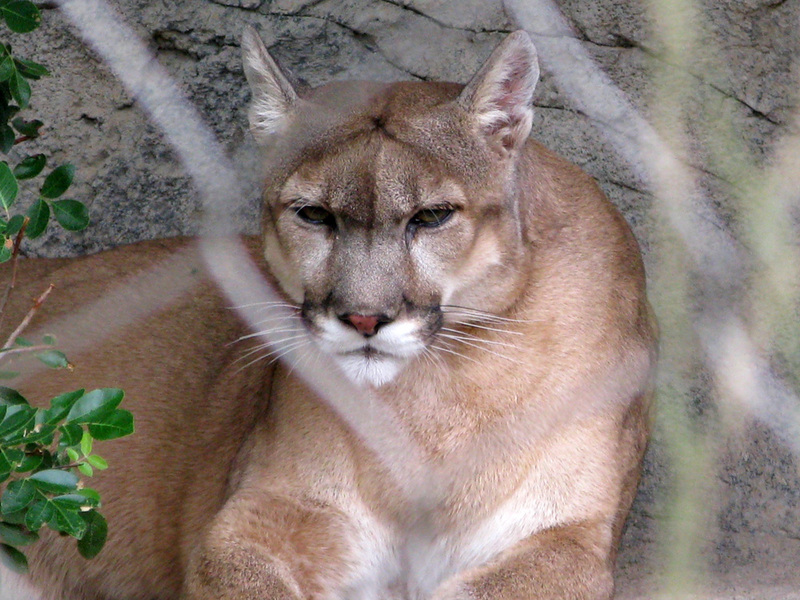 PS: I suppose that the mountain lion was a cut and paste drill..wasn’t it? I think your photos and comments are outstanding. 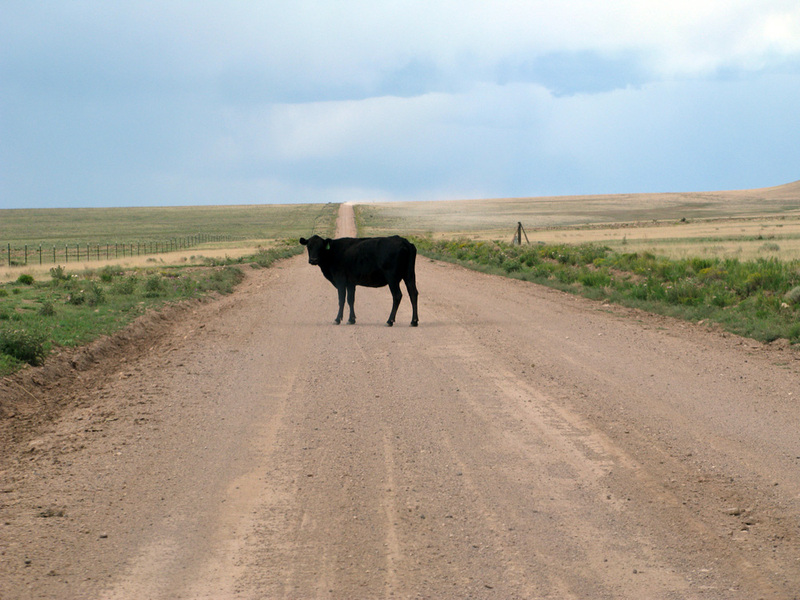 But I have to point out an error in one of your VLA photos. 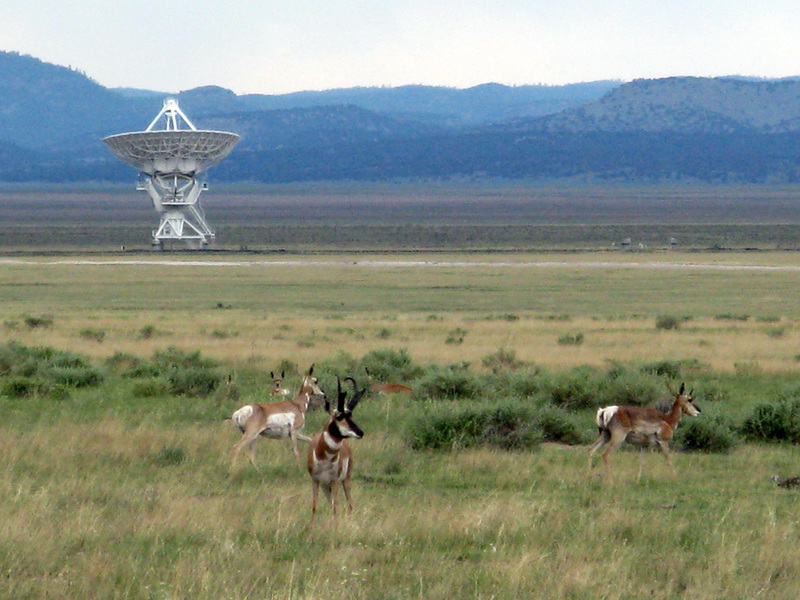 The animals in the picture are pronghorns (Antilocapra americana) and are native to the American west. It’s true that oryx were introduced in New Mexico, near White Sands, but these animals aren’t oryx.